Sometimes a recipe calls for just a little bit of something, but that means you have to cook the whole thing or open an entire can or jar, leaving you with the rest that has to be used up before it goes bad. Well, a way that I've dealt with that for years is by freezing. Not just freezing the entire lot in a solid block though - that just puts you in the same boat next time you want to use a little bit! All you need is an ice tray (or several, depending on how much you have to freeze and whether you want to do it all at once), some plastic wrap, freezer bags, and a marker. Put the stuff in the ice tray. If you're putting more than one thing in the same tray, be SURE you'll be able to tell them apart! You may want to write down which squares have what, either in a numbered list, or a little drawing of the tray "grid"
Squish it all down and smooth it out. 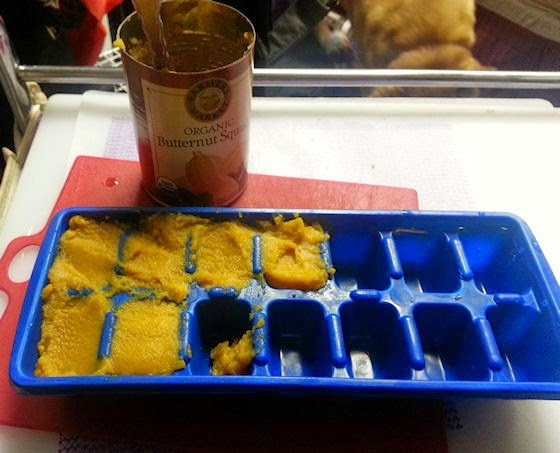 This not only makes it neater, but also gets rid of air pockets, which will help keep the the cubes at a constant volume, and prevent freezer burn. Smooth a piece of plastic wrap down against the food, pushing it down so it is in full contact. This also helps prevent freezer burn. Put the tray in a sealed freezer bag. My freezer bag wasn't quite big enough to seal around the tray, so I wrapped it up tightly in several layers of plastic wrap to keep the air out. 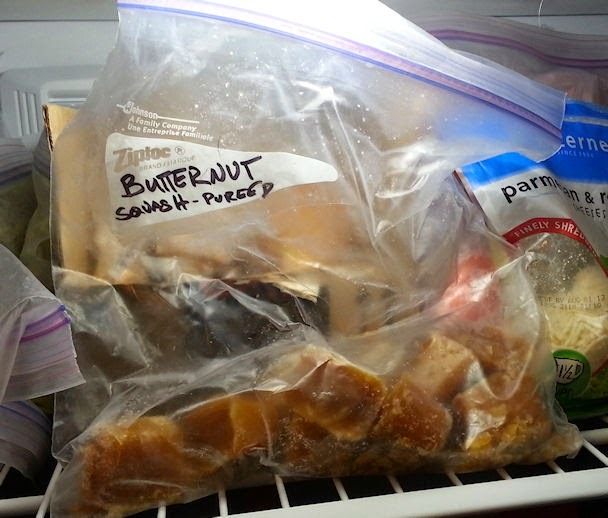 (Again, freezer burn prevention) Then stick it in the freezer. Once it's frozen solid, empty your tray into the bag and freeze. Now you can use as little or as much as you like at a time for recipes, single servings, etc. The picture doesn't show it, cause I forgot to do it at first, but it's always a good idea to include the date on the label as well. I have used this technique for years and years. It also works very well for preserves, fruit toppings, gravy, wet dog/cat food, pizza sauce,... Basically, anything that is the right consistency to go in the trays. Great for portion control and measuring.